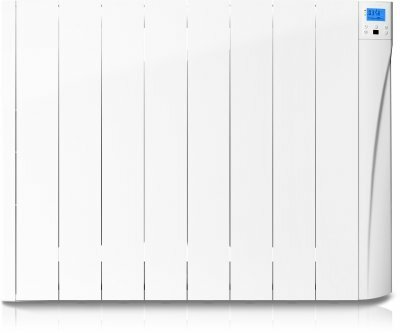 When searching for a radiator with a simply beautiful aesthetic there is no need to look any further than the Harmoni Lugo HS0880. Its sleek design favours a white finish and upward facing grille only 98mm wide, resulting in the model effortlessly dissolving into any residential or commercial setting. Under the bonnet, the Lugo features the most up-to-date electric radiator technology. 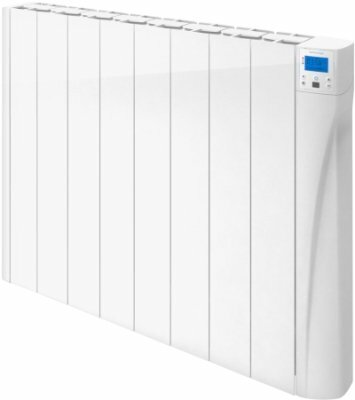 It has full control over its environment with its incredibly accurate electronic thermostat measuring room temperature to a quarter of a degree. The readings are easily visible and accessible through the Lugo’s bright blue front-facing LCD screen. It offers total manual control because of its digital buttons and infrared remote control. The remote gives access to the pre-programmed modes installed in the Lugo and also all your own personalised settings. 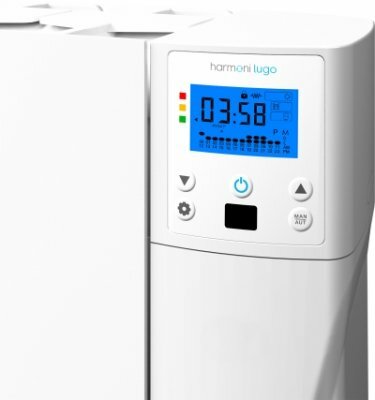 The Harmoni Lugo has an inbuilt 24/7 timer so your heating is always ready whenever you need it. Its energy-saving technology optimises your heating solution’s effectiveness, saving you time and money. Harmoni’s open window technology monitors the ambient temperature of the room and is able to react to any rapid variation. 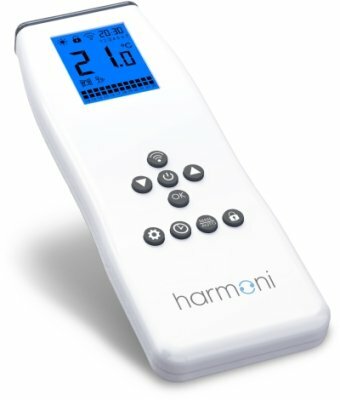 The Harmoni will pause its cycle until the temperature stabilises and then correct to suit your needs. This ensures a minimisation of energy wastage and a maximisation of efficiency. The Harmoni Lugo is Lot 20 compliant and has an IP44 rating. The pre-installed modes the Lugo features include eco, comfort and anti-frost. It also supports four editable programs. 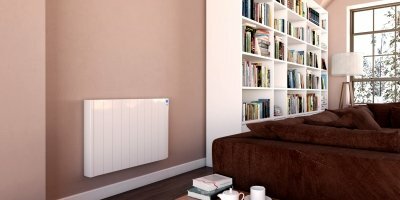 As an oil-filled radiator, the Lugo can fluctuate between temperature settings quickly and its aluminium shell ensures its surface temperature is reduced. The Lugo is incredibly quiet and its 110 watt per element ensures a comforting heating solution. The Lugo is designed to be stylish, minimalist and utilises recent technology to lower your carbon footprint and energy consumption. The Lugo drastically increases the comfort offered by your property whilst discreetly disappearing into the background, no thought needed. The Lugo offers a pilot mode, so after a user-friendly installation you can kick back and relax and let Harmoni take over. If anything was to happen we offer a ten-year warranty on every Lugo purchased. Heater Shop supplies the highest quality electric radiators, and if you have any queries we have our technical team on hand to assist - Just call 01473 276686. Great knowledge along with great service. Thank you for your great review and recommendation to others of our knowledge and service. We appreciate the 5 star feedback very much. Perfect, thank you very much for your great 5 star review. Only issue I've found so far is that the blue back light on the display is always on. This is quite bright in a dark room. The product is still excellent overall though. Simple to install and works very well. Quality product and service. Also very good value. Radiator is fantastic does what we hoped for. The item was well packed and delivered swiftly. The modern look suited our house. The online shop had a large range of relevant heaters to choose from. It was easy to see the specifications and price of each of them. Buying was quick and simple online. Thank you very much for taking the time to review us as excellent. We appreciate your really fantastic comments about our website and ease of ordering online.